Akai’s award-winning VIP is the first and only music software that enables you to control your entire VST instrument and FX library directly from any keyboard. Switch patches from all your VSTs in one place, instantly access pre-mapped plugin parameters for hands-on knob tweaking, customize pre-set loading from multiple VSTs using Setlists, and much more. 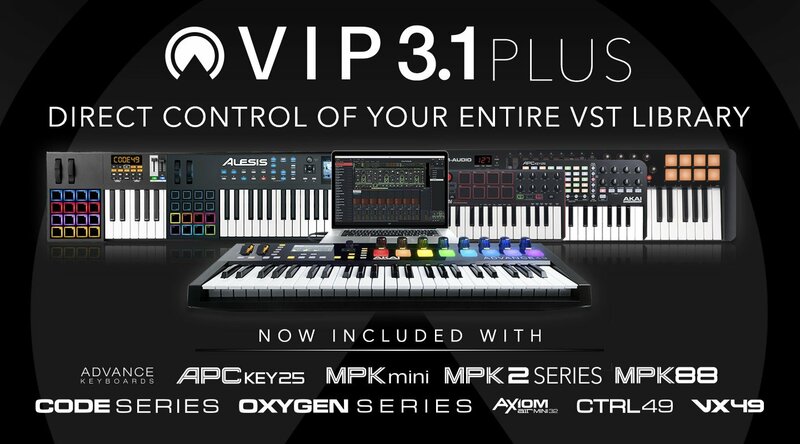 The VIP3 3.1 Plus bundle includes Akai's VIP 3.1 software and the following Air Music's plug-ins: CREATIVE FX Plus, Hybrid 3, Vacuum Pro, Xpand!2, Loom 1 and the ToolRoom Hybrid 3 Expansions, Plus, 40 Multis pre-built featuring chords from many popular songs for instant inspiration. VIP extends the capabilities beyond what any DAW offers by empowering you to quickly create and play "multis." A multi allows you to combine up to 8 patches from 1 or more plugins, with the ability to layer, mix and pan these patches all at once. VIP software users can also create setlists that provide on-demand access to your customized instruments for stage performance and studio work. By simply pressing a single button on any Keyboard, you can adapt to song changes as the live performance progresses-without ever reaching for your computer. That's what you want! VIP also brings you an intelligent patch browser that works across all your VST instruments to let you quickly find sounds based on instrument type, timbre, style or articulation, or simply explore patches you never knew you had! 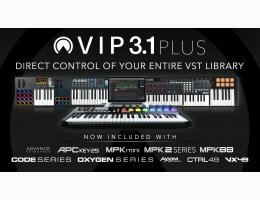 You'll also love VIP's facilities for browsing, key zone splitting, layering of up to 8 instruments per VIP instance, expansive custom mapping capabilities, and support for any VSTi plugin. You can run as many instances of the Virtual Instrument Player as your computer allows. VIP is ideal for live performance and a Standalone App with a built in Digital Mixer. It also runs as a VSTi, AU, or AAX plugin, allowing you access to VSTi's in virtually any DAW, such as Pro Tools, Logic Pro X and Ableton Live. Includes VIP, CREATIVE FX Plus, Hybrid 3, Vacuum Pro, Xpand!2, Loom 1 and the ToolRoom Hybrid 3 Expansions, Plus, 40 Multis pre-built featuring chords from many popular songs for instant inspiration. Plays virtually every VST-compatible plugin and effects unit. Operates as a standalone virtual instrument and effects player or as a plugin within any AU, VST or AAX compatible DAW. Organises user’s plugin collection with intuitive browsing by plugin, artist collection, instrument type, timbre and more. Includes an Effects Browser allowing users to browse effects by type and audition across multiple plugins with a single click. Access, edit and mix up to 8 virtual instruments at one time in a Multi. Expanded Multi mixer includes insert effects, send effects, bus tracks and a master output channel strip for total routing control. Effects Stacks combine multiple effects into re-usable patches, accessible in the patch list for easy selection and auditioning. NEW VIPMS. The VIP Native Plugin Map Standard allows 3rd party virtual instrument and effect developers to produce their own plugin maps for enhanced VIP integration and opening their plugins to the superior workflow offered by VIP. Will support entire EastWest Creative cloud at launch. NEW MIDI Learn functionality. Seamlessly maps the controls of any VIP compatible keyboard (knobs, encoders, faders, buttons) to VIP’s parameters with a growing library of MIDI controller mappings for Akai and M-Audio controller keyboards included. NEW Pad Chord Progressions. Play factory or user defined chord progressions using a VIP enabled keyboard controller’s pads. NEW Key Control modes. Play scales, harmonised chords or chord progressions from a VIP keyboard or MIDI keyboard.